A century ago, paranormal investigator Edward Gray fought and destroyed a powerful warlock off the coast of the island of Saint-S�bastien. In the early 1980s, the B.P.R.D. 's newest agent was sent to retrieve the warlock's remains. But Abe Sapien is ill prepared for the dark forces that block his way. 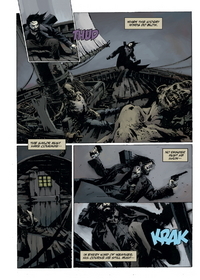 Written by Hellboy creator Mike Mignola, and featuring the haunting art of Jason Shawn Alexander (Damn Nation, The Secret, The Escapists), Abe Sapien: The Drowning is the story of Hellboy and B.P.R.D. mainstay Abe Sapien's first solo adventure. Sketch book de 5 pages.